@FirehouseSubs has an amazing sandwich called the Smokehouse Beef & Cheddar Brisket. Unfortunately, this is not that sandwich. This is the amazingly beautiful and seductive Firehouse Hero. 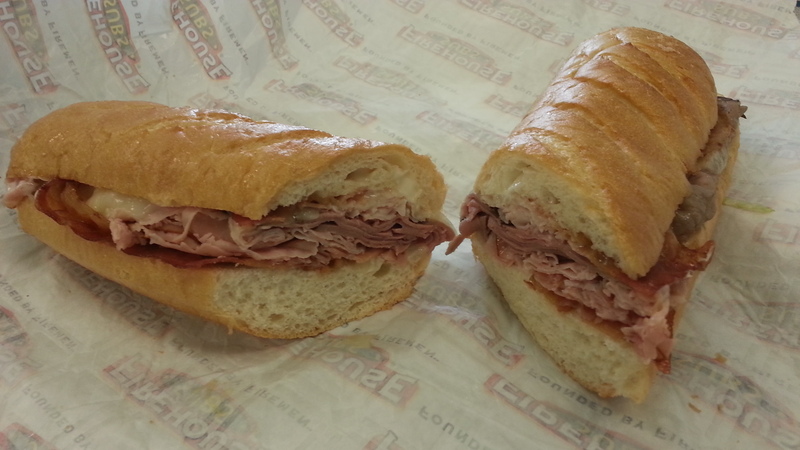 A heroic combination of roast beef, smoked turkey, Virginia honey ham and melted provolone. For a small upcharge they even added bacon! Sounds amazing, right? I thought so. So did Bob and Mike as we all three got the same thing. Well, as they say, looks ain’t everything and that was the case here. the downfall was the Virginia honey ham. I have never had honey ham with such an over powering sweetness! It’s all you could taste. Honey flavored meat on a pleasantly buttery sub roll. So if you like a cloyingly sweet sandwich, go for it. Maybe had I topped it with Grey Poupon or a Chipotle sauce it would have been better. Suffice it to say I’m back on the Brisket when I get @FirehouseSubs.